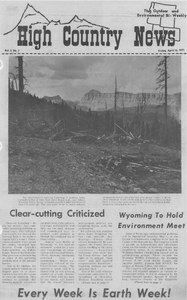 In hearings at the nation's capitol, Sen. Gale McGee called for a two-year moratorium on clear-cutting in national forests, underscoring the increased criticism that timber practices have come under in recent years. A discussion of the hunting habits of coyotes and wolves as they relate to both wildlife and livestock. Part four in a multi-article series on predator control on Wyoming. The Targhee National Forest has decided to discontinue chemical treatment of mountain pine beetle in lodgepole pine stands, primarily because the treatment has been found to be ineffective.